I am fundraising to Give children like Aishwarya,Ananya and Aditi the life they deserve! a commuity where you are accepted & can actively participate. They create an atmosphere of trust where people support and respect each other,a place where the abilities and the potential of the child are brought out with confidence. In addition, child friendly spaces give children a safe place where they are protected from harm,abusement and antisocial organisations.They can get clean water,health services,counselling and the oppurtunity to simply play and forget their troubles. I BELIEVE THAT EVERY CHILD HAS A RIGHT TO A LOVING FAMILY! GIVE THEM A FAMILY,THEY WILL MAKE US PROUD ONE DAY!!! LETS COLLECT 2,07,400 WHICH WILL BE DIVIDED EQUALLY TO SPONSER 10 CHILDREN FOR A YEAR! Aishwarya was only 10 years old when she was brought to one of the SOS Children’s Villages in India. Being an introvert, she took time to mingle with her SOS brothers and sisters. Little did she know that the love and care given to her by her SOS mother will immensely help in overcoming her past and in leading her to a better life and future. Aishwarya was enrolled in an English medium school and it helped develop in her, a sense of community and belonging. Aishwarya now participates in both curricular and extracurricular activities and is also learning classical dance and drawing in the nearby Bal Bhawan. Ananya is 9 years old and studies in 3rd standard. When brought to an SOS Children’s Village, she initially took her own time to find a connect with her SOS brothers and sisters. Initially, it was hard for her to be adapting to the new family environment, but things got better with time. Today, Ananya is one of the most active kids in the village community. It is also heartwarming to see her develop a sense of sharing at such a tender age, as she never fails to share her eatables with her family members. Aishwarya’s and Ananya’s youngest sister is Aditi, who is studying in 2nd standard. Aditi loves watching cartoons and the warmth she exudes as a child has only made her adapt faster to the new family environment than other children of her age. 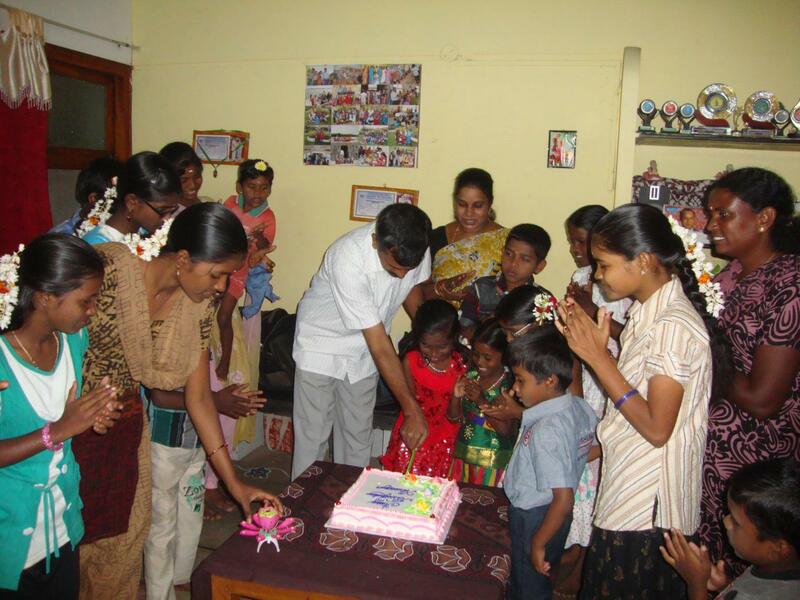 Ananya cutting her birthday cake along with her SOS family. All 3 of them are biological sisters who were brought home to an SOS Children’s Village in July 2012. Their mother passed away due to a cardiac arrest followed by their father dying of severe alcohol abuse. Not being able to provide them with basic living conditions, their uncle brought them to the SOS village. The way their lives have undergone positive transformation in last 3 years have been nothing short of an inspiration. Care, Education, Nutrition, and General Development have been the core focus areas for ensuring a holistic growth for SOS children like them. There are many more Aishwaryas, Ananyas and Aditis waiting at an SOS Children’s Village across 22 states in India to take this walk with you. Come forward and support the education cost of 10 SOS children who were once left to fend for themselves. They deserve a chance to be a child again. Support them now! Hermann Gmeiner started SOS in austria after the 2nd world war to build loving families and supportive communities for the children . HOW IS SOS DIFFERENT FROM OTHER CHILD CARE CENTRES? 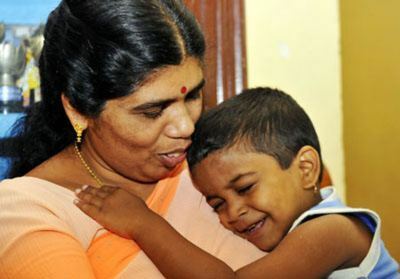 The unique feature of sos is they create a loving family which is so important for the growth of the child. HAVE U VISITED A CENTRE? Yes!when i heared about sos ,I want to see the miracle happening with my own eyes! I visited a centre in east tambaram.I talked with one of the mother and few children to see if they are truly benefited.It only proved their dedication and quality of standard! WILL WE KNOW THE PROGRESS OF THE CHILD WE SPONSER? Yes!we will be updated about the child's growth and developent and how our donations are helping the children by regular communications. WHAT WILL MY CONTRIBUTION DO FOR THE CHILD? Your contribution enables the child in need to grow up in a loving family,in a SOS children's village,receive education and become a responsible adult.You will be happy to know that your support provides for the physical,material and emotional well being of a child.